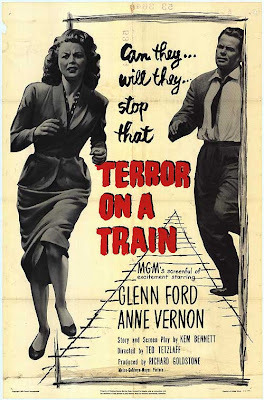 Rupert Pupkin Speaks: Warner Archive Grab Bag: DIMITRIOS, LOOPHOLE, TERROR ON A TRAIN, SCAPEGOAT, WISDOM ""
I first became aware of Jean Negulesco with his film THE BEST OF EVERYTHING, which seems an big influence on AMC's hit show MAD MEN. It's a very trashy soap opera of a story about the ad game in the late 50s. Exploring his films a bit further, I found he did a lot of stuff along these same lines. So needless to say, when I saw that helmed this particular picture I have to admit that I didn't expect it to be as good as it is. And it is damned good. I only saw it for the first time this year and it was very much a cinematic "where have you been all my life" kind of epiphany. You see, THE MALTESE FALCON is among my very very favorite films of all-time and I find it only improves with each viewing. 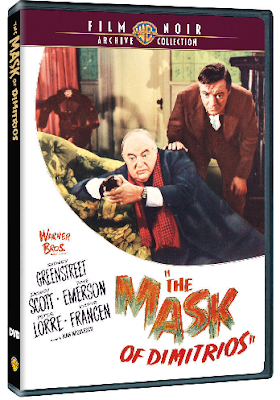 So it obviously made me a big fan of both Sydney Greenstreet and Peter Lorre. Let me just say, if you're a fan of classic films and you're NOT a fan of Greenstreet and Lorre, I just don't know what to tell you. They are a dynamic duo beyond most any I can think of. Folks know them from THE MALTESE FALCON and CASABLANCA of course, but I have found a great deal of goodness in digging deeper into their other film pairings. Don Siegel's film THE VERDICT is one of their gems I've unearthed in recent years. Anyway, DIMITRIOS very much has a kinship not only with THE MALTESE FALCON, but also with THE THIRD MAN(and even CITIZEN KANE structurally). Its titular character is spoken of and stories are told of him throughout the 1st 3/4 of the film so he truly does take on a certain mythical status. Zachary Scott(who, to me resembles Lee Van Cleef a little) plays Dimitrios and he does it quite well. Both Greenstreet and Lorre are aces here, but that pretty much goes without saying. Greenstreet is at his shifty, slippery best. Hard to believe an actor that I love so much got his start so late in life, but that has happened from time to time. Like every film on her list, I did my best to seek it out ASAP. It reminded me of an Andrew L. Stone type picture(see below!). I guess the one that springs to mind is THE STEEL TRAP, mostly because Joseph Cotten's character works for a bank in that film as does Barry Sullivan in this one. 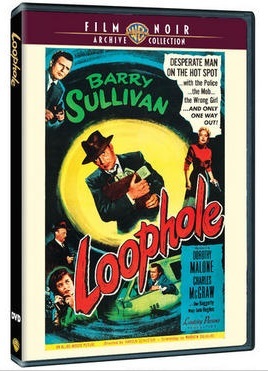 The difference being that the missing money in this film was not taken by Sullivan's character whereas Cotten's does steal cash. I know many cinephiles have a larger awareness of Barry Sullivan than I do, but I mostly knew him from Bava's PLANET OF THE VAMPIRES. So here he finds himself in a noir picture on the wrong side of Charles McGraw. Note to all you kids out there: it is not recommended that you tangle with Charles McGraw in a noir film(or any other film for that matter). He's tenacious like a freakin' bulldog and he will take you down! Even if he's wrong in his accusations, he is relentless! Also known as TIME BOMB. Director Tetzlaff was a cinematographer first and worked on some cool stuff like NOTORIOUS, I MARRIED A WITCH, TALK OF THE TOWN, EASY LIVING and MY MAN GODFREY. Lots of comedies there. His directorial career was also pretty solid, but grittier with entries like THE WINDOW, RIFFRAFF and JOHNNY ALLEGRO. So this film starts with some workmen loading a bunch of explosives onto a train. Always quite promising, especially when they make sure you read the tag posted on the side of the train car that reads "Explosives". What follows is a rather British(less Glenn Ford) procedural dealing with trying to safely divert said rolling box of explosives. Glenn Ford plays a former bomb disposal man who is in the closest possible proximity to help out. Little bit of a slow starter, but for those of us that love our Glenn Ford, it's worthwhile. Andrew L. Stone is a dude you should check out. I recall hearing Tarantino mention him in the commentary track he did for TRUE ROMANCE. I think he was speaking of his film HIGHWAY 301 in that context, but seemed a fan of his in general. Stone makes cool, stripped down thrillers. Have a look at CRY TERROR or THE LAST VOYAGE for examples. This movie is more of a potboiler type thingy. Broderick Crawford can be one evil dude when he wants to be. In DECKS his is ruthless to a t. He's crewing on the SS Berwind, a grimy freighter that he has come up with a plan for. His scheme is to murder the rest of the crew and sell the ship for salvage to the tune of a million clams. 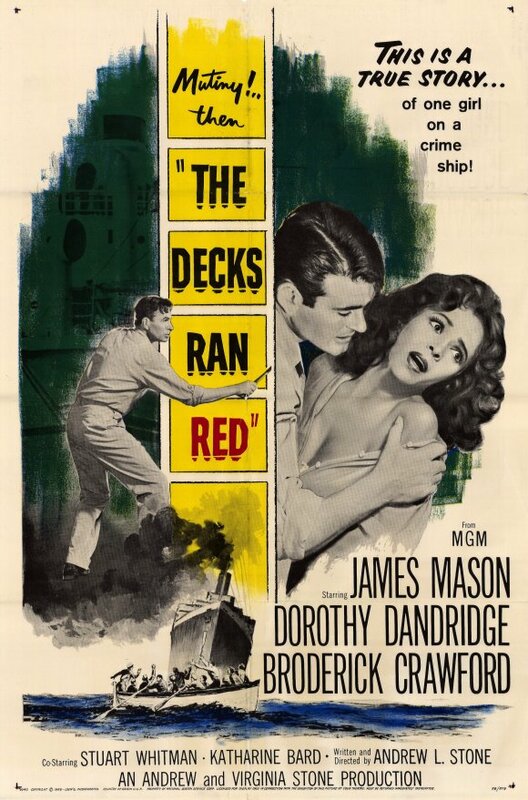 One man standing in his way is the new ship's captain played by James Mason. Also complicating the mix is the presence of the cook's wife(Dorothy Dandridge) who is constantly "stirring the pot" with her gorgeousness and sexuality. Not Andrew L. Stone's best by any means, but recommended for fans of his movies. Obi-Wan is twinsies! When I first heard the description of this film, it sounded to me a little like the setup for a low-key Twilight Zone episode. TWZ meets Hitchcock. Well it's not that really. It's more of a family drama of sorts. The idea is that a French nobleman switches places with a discontented university professor(by chance, they look identical - Alec Guinness plays both roles). The nobleman dupes the professor into the switch and he initially resists, but when he sees that the situation with the nobleman's family is in disarray, he decides to stick around. He has no family of his own so he seems to be taken in by both even this dysfunctional one. It gives him a new found purpose. It's an interesting tale for sure, well played by Guinness.It is however based on a novel by Daphne Du Maurier(who penned the book REBECCA was based on). When I heard it described to me, I heard a description of the tale told in the book. As is often the case, some things were excised in the film and that is unfortunately to its detriment. Still a decent movie though, and worth a look. Though it certainly suffers from "first time director syndrome"(including a straight PSYCHO eye-dissolve-from-drain rip), I still found things to like in this first effort from Estevez. I've always been a huge proponent of his sophomore effort, MEN AT WORK, so it was interesting to see what kicked things off for him. He got some heavy-hitters to back him up aboard WISDOM with longtime Spielberg editor Michael Kahn cutting and Danny Elfman composing(in an uncharacteristic, but memorable score). It's a pretty simple story of a kid, driven by one felony charge and an inability to get steady work, to turn to a life of crime. 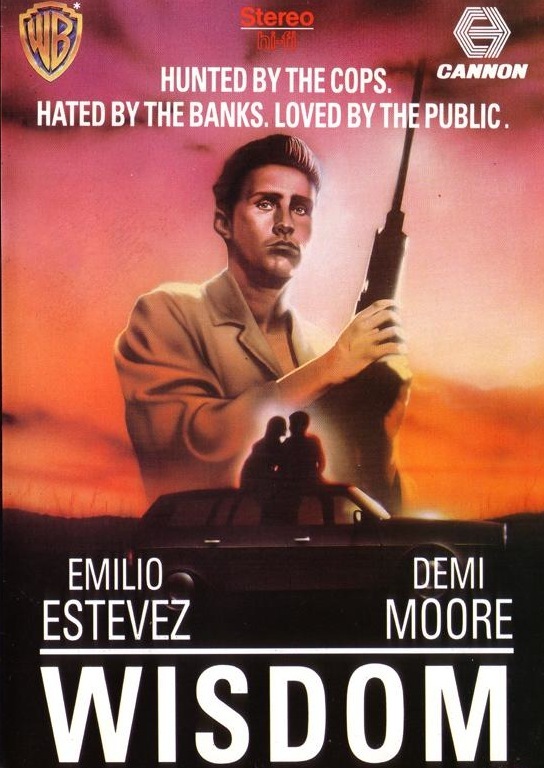 Estevez is at least trying to address some societal issues here though. He even did that in MEN AT WORK to some degree. It's a bit heavy handed here(as is the films voice over), but come on, points for trying(Estevez was only about 24 when he made this movie). The crimes his character commits are more of an analog FIGHT CLUB-by bit of business as opposed than real robbery. And what he's doing has a certain resonance especially today. All in all, an interesting curio for Brat pack fans. Kind of a lesser FALLING DOWN meets Bonnie and Clyde. DIMITRIOS has been on my must-see list for a long time, but impossible to find. WISDOM was cool. I saw it many, many years ago.